An orange and fennel salad is a great accompaniment to this dish. Simply thinly slice two bulbs of fennel and put in a bowl with four segmented oranges. Toss well and add a little cracked black pepper. Melt the butter in a medium saucepan set over a medium heat. Add the flour and whisk together to make a roux. Gradually whisk in the milk and bring to the boil, then reduce to a simmer for 2 to 3 minutes, stirring all the time, until the sauce has thickened and the flour is cooked. 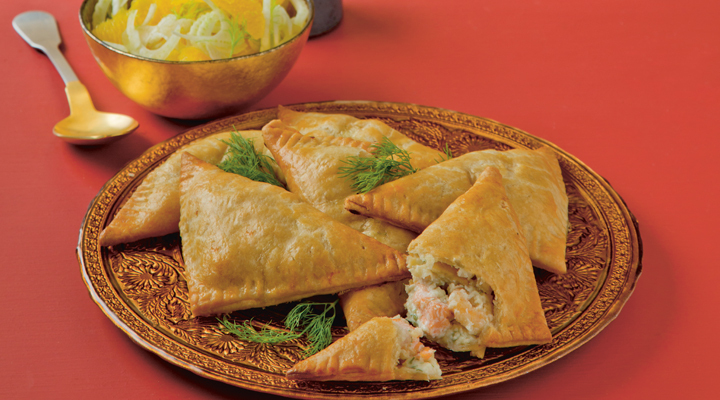 Season with salt and pepper, then fold in all the seafood and the dill and allow to cool. Unroll the pastry sheets and cut each one into four squares. Use the remaining pastry to make two more squares. Spoon the filling onto one half of each square, brush the edges with beaten egg and fold over into a triangle, pressing gently with a fork to seal. Put on the lined baking trays, brush with a little more beaten egg and cut a small slit on top for steam to escape. Chill in the fridge for 20 minutes. Bake in the oven for 15 to 20 minutes, until the pastry is golden brown and the filling is bubbling. Allow to cool for 5 minutes before garnishing with a few fresh dill sprigs and serving with an orange and fennel salad for an easy lunch or supper.